Finally, a complete Graphical User Interface Design that includes EVERYTHING ! 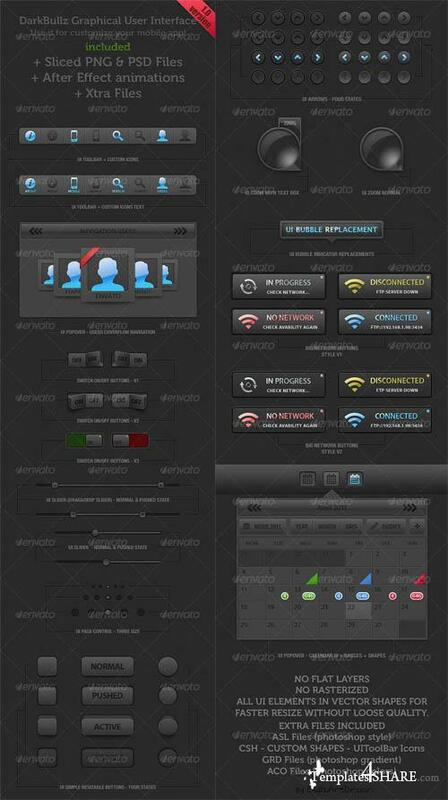 Everything you need to build the interface of your mobile application is in this PSD files. All elements are scalable to the size as you want, and extremely easy because all parts are created with vector shapes. Various UI elements are available in several colors and colors that will not require a single click from you to change it. We especially consider our UI design for easy customization of a mobile application, so you'll just copy/paste different items you'll need since we have included the .PNG and .PSD files pre-sliced. Some elements have requested special attention for it as necessary to create specific events. These animations are very high quality and optimized for mobile devices. The After Effect animation files are included and obviously pre-rendered for each of the animations is also included in .PNG format (image by image) and in several colors. No need to be a professional Photoshop, Illustrator or After Effects to change our UI and adapt to the size of your application is really a childlike simplicity. Like every time we submit a .PSD files on Envato, we took care to include extras files. Also .asl (Photoshop styles), .grd (Photoshop gradients), .aco (color palettes photoshop) and .csh (custom shapes) are included.